Santa Ana restaurant housed inside an Embassy Suites. 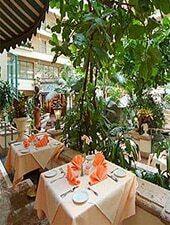 : Capistrano's is not located in San Juan Capistrano, but in the lobby of the Embassy Suites hotel off Dyer Road near the John Wayne Airport. This California-style restaurant serves up lunch and dinner inside the airy atrium. This space also caters to special events, large groups and wedding parties.